Take a look at the photo above. I’m confident that there are numerous emotional paths that that photo can evoke, but one thing that comes to mind is the stupidity of what she’s doing. She’s changing her baby’s diaper. On the job. She’s…multitasking. Ugh! Your brain has two frontal lobes. These lobes can handle two tasks, to a certain degree. 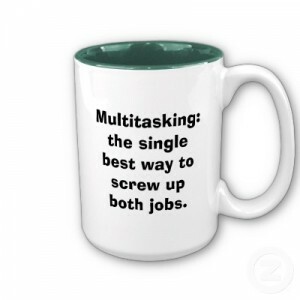 However, when you multitask, or attempt to do such rather, your brain reduces the ability to perform both tasks. Your brain has one “eye” shut to each task which is equivalent to having each task use 50% less brainpower for attacking and processing information, half of which is divided between referring to prior knowledge stored in your long-term memory and processing the real-time experiences with your short-term memory. You therefore become less efficient in both tasks, giving you relatively the same amount of efficiency as being when you’re half asleep. Which is why I hate seeing people talking on the phone, texting, and/or eating while driving. It drives me nuts. According to the Virginia Tech Transportation Institute, driving while texting makes one 23 times more likely to be in a crash (or a near-crash event) than a non-distracted driver. Good job guys. So all those obnoxious All State commercials with the guy in the suit are right. Not only are you losing efficiency for two tasks, your brain might simultaneously be attempting to tackle three. For example, you’re trying to balance two tasks, but suddenly your Facebook notifications start flaring. You click on a few, thinking that you’ll retain your original train of thought. What happens is that one of the original tasks disappears from your brain, and is then replaced with the new task that you have given yourself: Facebook. So by the time you pull your head out of the Lotus-like realm of Facebook, you will have forgotten one of your original tasks. I candidly guarantee it. The mug says it all. This entry was posted on Thursday, September 23rd, 2010 at 11:23 pm	and tagged with brain, driving, drunk, DUI, efficiency, getting high, jobs, marijuana, neurology, neuroscience and posted in Curiosity. You can follow any responses to this entry through the RSS 2.0 feed.